Finding insight in oceans of data is one of enterprises' most pressing challenges, and increasingly AI is being brought in to help. Now, a new tool for Apache Spark aims to put machine learning within closer reach. Announced on Friday, Sparkling Water 2.0 is a major new update from H2O.ai that's designed to make it easier for companies using Spark to bring machine-learning algorithms into their analyses. It's essentially an API (application programming interface) that lets Spark users tap H2O's open-source artificial-intelligence platform instead of -- or alongside -- the algorithms included in Spark's own MLlib machine-learning library. 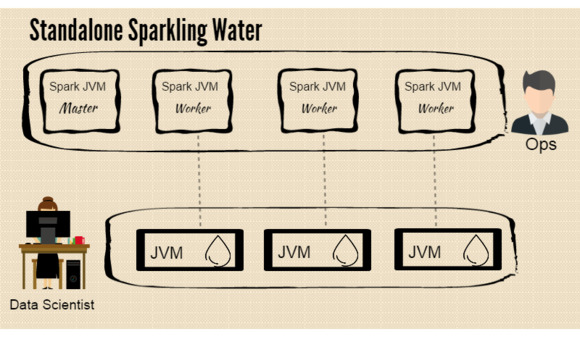 Among the highlights of the new software is the ability to run Spark and Scala through H2O's Flow user interface. Sparkling Water 2.0 also brings a new visualization component to MLlib, giving users the ability to see their algorithmic results in an easy-to-digest form. The software supports the Apache Zeppelin notebook as well as Spark 2.0 and all previous versions. It offers production support for machine-learning pipelines. Model and data governance can be handled through H2O's Steam data-science hub.